These are my basil plants. It’s the second year I’ve tried growing basil, and I can’t get it right. Here’s where I think I went wrong: I sowed the seeds directly into potting soil. The first year I put them in the ground (I can’t remember if they were seedlings or direct-sow), and they bolted. Also, some kind of invisible pest has been consuming the leaves. In fact, nearly all the plants on the property have fallen victim to mysterious munchers. I’m jealous of people who say “I have too much basil.” I love basil, and can’t wait to have the same bounty others seem to achieve with little effort. I’d like to try keeping basil in containers. Anyone have suggestions for the ideal growing medium? 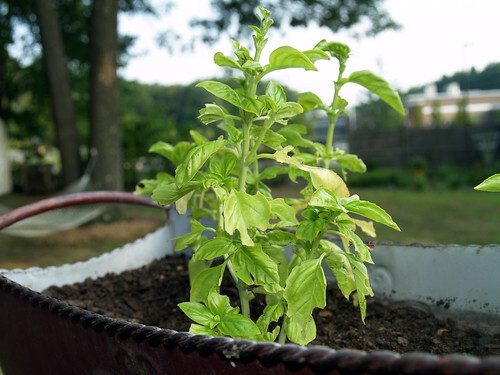 Your mysterious munchers are junebugs and they’re eating your basil at night. The only solution I’ve come up with is planting more basil so I don’t mind that they get part of it. I have it growing in about 10 different spots and have probably almost 10 different varieties. Last year was a terrible growing season and I had next to no basil or tomatoes, which is a long intro to saying that I don’t think the growing medium is a problem. I’m using potting soil for all my basils. Just keep pinching off the flowers and it won’t bolt. Thanks, Heather. I’ll keep up the good fight! It’s too bad the June Bugs got out of control this year. They decimated so many things.